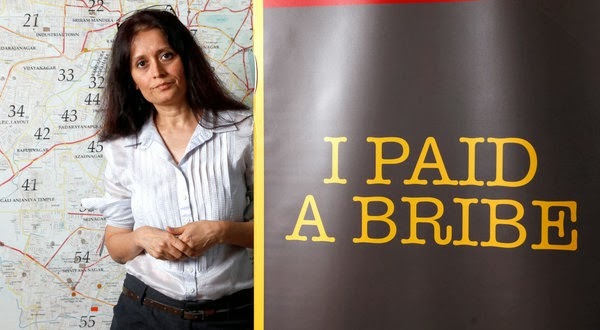 Swati Ramanathan, a founder of the site I Paid a Bribe, in India. In my International Business course we held an online chat session last night. We discussed an HBS caselet involving a petty bribe. The American manager of an Indonesian branch plant was asked by his administrative assistant whether he would authorize her paying from the petty cash account the equivalent of $25.00, in order to get a police clerk to look up the date of purchase of an old company car that the division was trying to sell. Without that date, the sale would be impossible, as it was missing from the company's records, though the police had it in theirs. Of course, there was no fee charged legally to look up that official record, but the police clerk had asked for this payment, nevertheless. Would you have authorized that payment? Perhaps because our earlier discussion had dealt with the legal risks of an American businessperson's participating in foreign corrupt practices (albeit in much higher-level forms of corruption, amounting to values in the millions of dollars), all but one of my MBA students declined to pay this petty cash "dash." I am quite sure I would have said, "Do what you have to do." Typically petty cash is exactly that...cash that is used for petty expenditures. So despite the actions the cash is being required for seeming a tad questionable, the funds are available and at the ready for whatever needs might come along in the office. So I do tend to think this might be of of those such cases. Many, if not most, would agree. This is generally what is meant by a grease payment, a petty bribe to get a bureaucrat to do his job. It ain't right, but it is reality. The subject has had considerable attention of late. See this link. I was previously unaware of these "I Paid A Bribe" websites. What a change it will be if the Internet brings about an end to the world of bureaucratic corruption! Imagine a world where public employees simply do their jobs for the public who pay their salaries!